If you are reading this out of sheer desperation at 3 am, you have our sympathies. You might have snorted in disbelief when you read the words “wake up refreshed”, but I promise you—it can be done! While every person and pregnancy are completely unique, these pregnancy insomnia remedies, tips, and tricks have been known to work for the vast amount of women…chances are, pregnancy insomnia remedies will work for you too! First of all, why is your tiny little baby tucked safely in utero already causing you to lose sleep? Wasn’t this only supposed to happen after birth? I’m afraid not! Pregnancy insomnia is completely normal and has plagued women for thousands of years. Plus, it can just be hard to get comfortable. If you are normally a back or stomach sleeper, you may have a hard time getting comfortable in the required side sleep position. And—don’t forget—you’ve got a growing baby that gets bigger every day in your belly! So, now that you know why you are wide awake in the middle of the night, let’s bring on the pregnancy insomnia remedies. 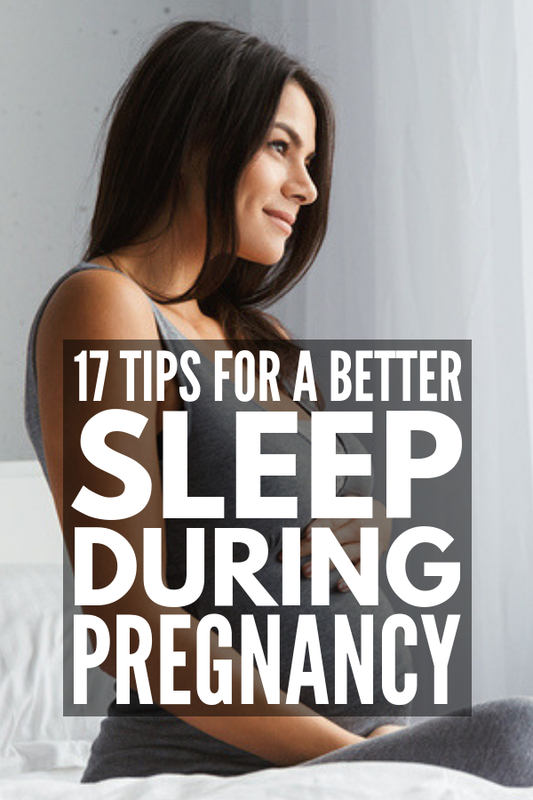 There are a lot of products out there that claim to help women sleep better during pregnancy. As in most things, however, the proof is in the pudding. These products can all be ordered off Amazon (3 cheers for fast, free shipping!) and have excellent reviews from dozens of women. Side note – don’t try anything you aren’t comfortable with, and please run changes by your doctor. Try a little aromatherapy. Give your pillow a spray or two with this lavender chamomile linen spray. It’s made with 100% pure therapeutic essential oils and combines two scents that are known to induce relaxation. Block out blue light. You might feel a little silly, but try wearing these orange-tinted glasses in the evenings if you use blue light. Blue light includes anything electronic like TVs, many kinds of light bulbs, and—yes, your phone. Find the right temperature. If you are pregnant, you are probably overheating most of the time. If your partner can’t handle keeping the air conditioner on blast every evening, grab a tableside fan like this one instead. Self-sooth with white noise. Chances are you’ll soon be hearing white noise on blast every evening through the baby monitor, so start enjoying it now with a white noise machine. This can be particularly helpful if you are a light sleeper or share a bed with someone who snores. Have a nightcap. A cup of relaxing tea in the evenings can be a great way to wind down and prepare your body for sleep. This soothing blend is made especially for mom-to-be. Cuddle up to a body pillow. A curved body pillow like this might become your best friend for the next few months as it supports your aching back and helps you find comfort on your side. As an added bonus, you can use it to prop your arms and baby up on while you breastfeed later if needed. Practice yoga. Even novice yogis can appreciate the gentle stretching movements of a pregnancy yoga DVD . Make sure you check with your practitioner before beginning any new exercise routine, however! Take care of your aching neck and back. Here’s a pregnancy insomnia remedy to be excited about…a neck and back massager! This handy machine will quickly be your go-to for a quick relaxation session. Invest in a foot spa. Likewise, if you are suffering from aching feet and can’t seem to get comfortable, a foot soaking tub with heat and massaging features is a purchase you’ll reach for over and over again. Journal it out. Last, but certainly not least, if you are having a hard time sleeping, get up and spend 5-10 minutes journaling. Try a pregnancy journal like this one to pass along to your little one someday. There are plenty of natural pregnancy insomnia remedies to use as well. These little tricks can make a big difference each evening—try and see! Try evening meditation. If anxious thoughts are thwarting your ability to get rest, evening meditation practices can help soothe your overactive mind. There are several apps you can download to help walk you through meditation sessions, or you can look on YouTube and choose a calming video there. Exercise daily. Whoah, mama! No, now is not the time to begin marathon training, but daily exercise is a great way to raise those endorphins and get your body a little more tired. Walking is a good excuse to get out and stretch your legs and get your heart rate up. Another popular exercise option is pregnancy yoga. Search online for classes in your area, or look up a video you can do at home daily. Create an evening routine. Start preparing for bedtime an hour or so before you actually climb into bed. Make an effort to turn off electronic screens, and instead read a book, work on a jigsaw puzzle or journal. An evening soak can also help you wind down and relax—whether you soak your entire body or opt to just soak your feet instead, make sure you keep the water on the lukewarm side. Cut off your liquids. Try tapering off your liquid consumption in the evenings to help curb your overactive bladder. You may not be able to make it through the entire night without needing to use the restroom, but cutting your trips in half would be a great start. Spend time in the sun. Spend at least 20-30 minutes daily in the sun for vitamin D consumption and to help your body differentiate between day and night. Don’t forget the sunscreen, though! Have a glass of warm milk. Yes, your grandmother’s pregnancy insomnia remedy is still around and active. A glass of warm milk is said by many to help fill their stomachs and make them more sleepy. Add a bit of cinnamon or honey if you’d like. Be wary of dairy if it exasperates your heartburn—instead, reach for dairy-free milk like almond or coconut milk. Create a sleep-healthy environment. If your bedroom is filled with clutter and bright lights, you’ll have a much harder time relaxing. Create a sanctuary for yourself in your room. Invest in blackout curtains or a blindfold to block light, and switch off your phone. Dim your alarm clock or face it away from you as well! As you can see, there IS relief out there with these pregnancy insomnia remedies! Give a few a try and keep an open mind! If you found this collection of pregnancy insomnia remedies helpful, please share this post on Pinterest! And if you’re looking for more parenting-related tips and trick, please follow our Parenting board where we share all kinds of great advice we find each day!